Adrian Cresswell, the Internal Exclusion Centre Manager from Newman College in Royton, Oldham, is undertaking a charity bike ride on behalf of The Poppy Appeal, Royal British Legion. 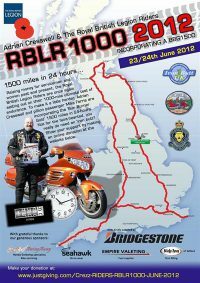 Adrian, along with his son-in-law Mike, will be hoping to raise over £1,000 for the cause as The Royal British Legion is a UK charity that provides financial, social and emotional support to millions who have served and are currently serving in the Armed Forces, and their dependents. They spend £1.7 million every week on welfare activities as he is a serving Major with Greater Manchester Army Cadet Force and therefore connected with the Armed Forces. As a valued and long-term client of New Directions Education, we would like to extend our best wishes and support to Adrian and Mike.